Maya MacIsaac-Jones had her plan all laid out. 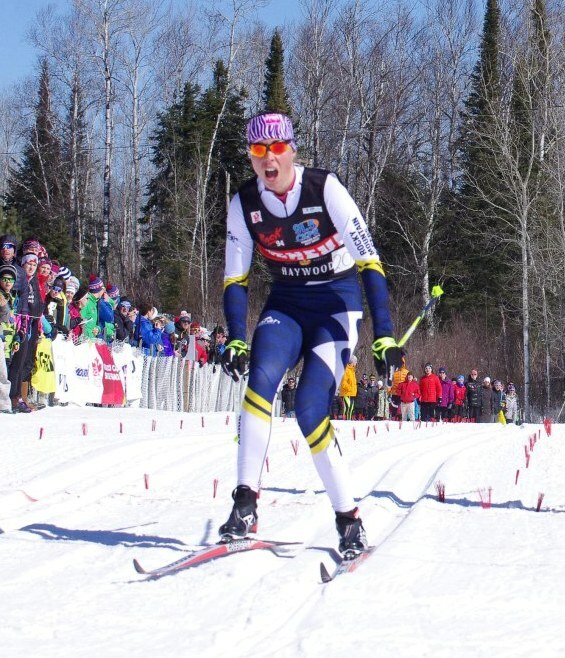 Hard training throughout the summer, some of it at National Ski Team camps, and then Europe for the World Cup season as part of CCC’s U25 National Team. It was going to be her first full time stint as a World Cup athlete, competing with the best of the best. She was boiling with excitement. But then everything crumbled down when a foot injury destroyed the plan. One can easily imagine how an athlete would be devastated by such misfortune, and she was. But Maya kept her head up, rolled up her sleeves and set her sights on coming back as soon as she could. Actually, she did not roll up her sleeves. She took out her bathing suit and swimming goggles and went training in the pool for a month! Along with some upper body exercises. Now she’s back on snow and skied one race last week-end in Sovereign Lake. We caught up with her to see where she’s at. SP: How did this foot injury happen? MMJ: At the end of October, a couple of days after I had gotten back onto snow, I woke up with a very swollen and sore left foot. After some quick visits to the doctor, I was told that I had developed sesamoiditis in my left foot. Basically, the bones under the ball of my left big toe had gotten damaged. This was likely caused by overuse during the summer and fall and was aggravated by getting back on snow again. SP: What was the diagnosis and recovery period requirements? MMJ: The initial diagnosis was that the bone had gotten bruised, not fractured. Since then, however, I have had conflicting information from doctors as to whether or not I was born with my sesamoid bone in two pieces (which is fairly common) or whether the bone had been fractured into two pieces. Regardless, the recovery plan has been the same; stay off my foot and avoid any weight-bearing activities until the pain went away completely and the swelling had gone down. For me, this ended up being about 4 weeks of swimming, upper body strength, pool running, etc. I got back on snow at the end of November and have been easing into on-snow training and intensity. Although I still have some swelling, things have gone really well and I’m able to ski pain-free as long as I’m careful! SP: How hard has it been on you not to start the WC season in Europe as planned? MMJ: Not being able to go to the WC races was very frustrating and upsetting. Making the decision not to go was very difficult because I’ve put in a lot of hard training this year and was really looking forward to racing on the WC. However, it has been so much fun to watch the other girls race and I’m really happy that Sophie (Carrier-Laforte) has the opportunity to race too! I think that the more WC spots we can fill, the better it is for our women’s team. Maya MacIsaac-Jones during a classic intensity session on Tuesday. SP: You started your season last week-end in Sovereign Lake. What was that like, how did you feel? MMJ: My sprint race in Sovereign was pretty disappointing. I was definitely missing my top end gear and was not skiing nearly fast enough to compete with the girls in the final. That being said, I was SO happy to be on snow and able to race! I was of course hoping to get a better result, but I also know that since I missed a month of on-snow training (where I would normally be fine-tuning my race speed) it might take me a bit longer than normal to reach race shape. SP: Any idea when will you be able to join your NST teammates? MMJ: I’ve been doing my best to take a long-term approach to this injury and I am focusing on making sure things heal properly the first time. My focus for the year is still on the U23 World Champs in January, so I’m taking all the steps I can to make sure I am healthy and skiing fast by then. In terms of racing on the World Cup circuit, a lot of that will depend on how fast I am skiing at World Champs trials in early January and at U23 World Champs at the end of January. Ideally, I would love to qualify for Senior World Champs and get some more World Cup opportunities around those races, but this will depend on how fast I am skiing! So Maya only did the sprint last weekend. Together with her coach, they decided it would be best to limit her to one day of racing. That way she would see how her foot reacted and could continue training through the weekend. The results were overall positive: “Fortunately, things were all good on the foot front!”, she concluded.